PUMA and renowned visual artist Bradley Theodore have teamed up to create a strikingly vibrant collection for 2019. Featuring Bradley’s signature colour-laden graphics with strong brushwork technique, this street art inspired lifestyle collection drops today. In his second collaboration with PUMA, Bradley brings his unique style to streetwear staples – reimagining them with bright pops of colour and rich symbolism that explores the human condition. PUMA silhouettes are enhanced with hand-painted symbols like skulls, hearts, and hashtags that reference today’s culture of representation and communication. A mix of classic and progressive PUMA styles, the collection highlights the artists hand-painted all over graphics, strokes and colour blocking with ‘CREATIVITY IS CULTURE’ printed under the tongue and a rubberised patch of his signature skull-icon featuring across the collection. 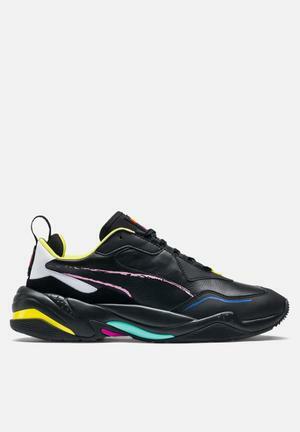 A progressive fashion-forward running silhouette, the PUMA Thunder Bradley Theodore is designed with a soft leather upper and contrast mesh lining, while the chunky sole is decked with neon colour-blocked TPU inserts. The PUMA Capri Bradley Theodore is a classic vulcanized silhouette built with a soft leather upper featuring hand-drawn effects of tonal glossy graphics on quarter panels with the famed NEW YORK script. 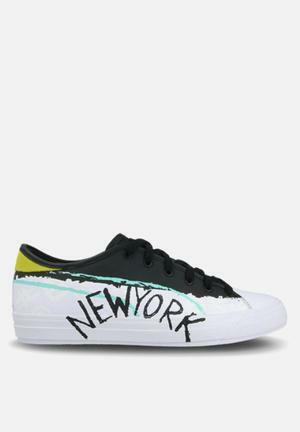 For the classic court silhouette PUMA Clyde Bradley Theodore the artist works with his colourful hand-drawn graphics on quarter panels and a debossed BRADLEY THEODORE signature on the medial side.